Wayzata Athletic Boosters has a tradition of partnership with area businesses. 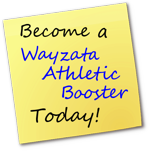 Each year, businesses in our community are invited to join Wayzata Athletic Boosters as Business Members. The funding provided by our business members provides uniforms, equipment, sports programs, school spirit items, team schedules, and rosters. - Your advertisement will be printed in various WHS sports game programs printed in the fall, winter, and spring (over 10,000 copies during the school year and more than 5,000 for football alone!). - A link to your business website under "Business Sponsors. - Complementary passes to a certain number of games during the school year. Trojan Pride ($1050) members receive a full page of ad space and 4 14-game passes. Trojan ($550) members receive 1/2 page of ad space and 2 14-game passes. Blue ($400) members receive 1/4 page of ad space and 22 game passes. Gold ($300) members receive 1/8 page of ad space and 14 game passes. Business Membership forms and promotional artwork must be returned to the school no later than July 31st for participation in the following school year.